In the summer time I enjoy doing miniature quilts, using my scraps. They are quickly done, and it's a pleasure to hand quilt them early in the morning, before the heat arrives! I tried to give this mini scrappy Log Cabin an antique country style. It measures 12 1/4" x 8 1/2". Look at those tiny stitches! Beautiful work and so sweet! I too like working on tiny quilts in the summer. This is going on my 'next" summer to do list: make an adorable mini quilt and hand quilt it! LOVE YOURS!! So little and so cute! Your quilt has got a lovely country look to it, very pretty and homespun. This is so sweet. Really lovely. Encore un adorable petit quilt ! Love your mini Log Cabin! You used great fabrics!! It definitely has a country look! Exquisite! It is the size of a sheet of paper here in Canada! but its' so much better looking. Congrats on an adorable finish. What a sweet little quilt Christine! It does have an old country style. Very Lovely! Such a sweet little quilt. The back is as lovely as the front. Sweet...and your stitches are wonderful! Very pretty fabric combination. What will you use it for? Too lovely for a mug rug. Beautiful! I haven't yet made a log cabin quilt but this is pretty inspiring! Love your log cabins! I've only done one log cabin project, but I really need to do more! Log cabins are something I want to make again too :) I like the idea of the really light with the really dark. I also like how you are hand quilting it. If only I could sew 24 hours a day! Wonderful little mini! I love log cabins and finally plan to do a larger size one after twenty years of quilting. 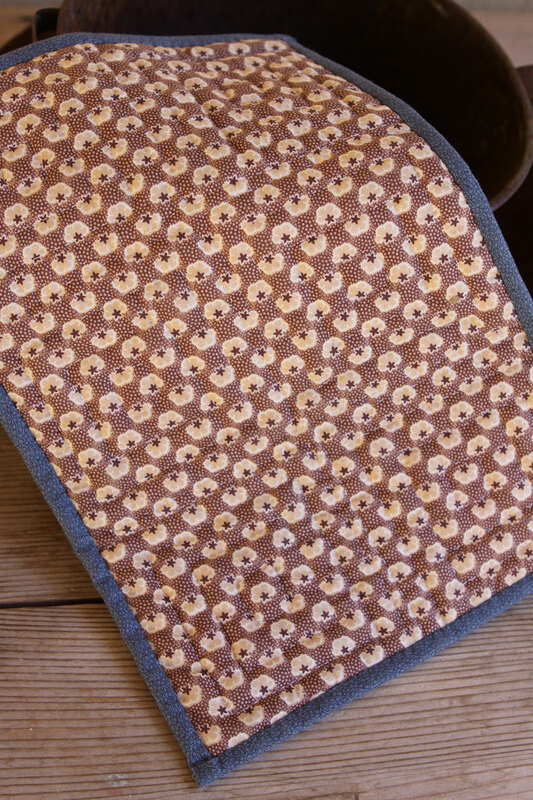 Your hand quilting stitches look wonderful on your mini! I love looking at miniature quilts. There is just something about them. Your log cabin is wonderful! I absolutely love log cabin quilts ... And having seen your mini log cabin, I definitely need to make one, too! Cute little quilt. I've been seeing such cute little quilts in blog land and am wondering what everyone does with the little ones. So beautiful Christine! 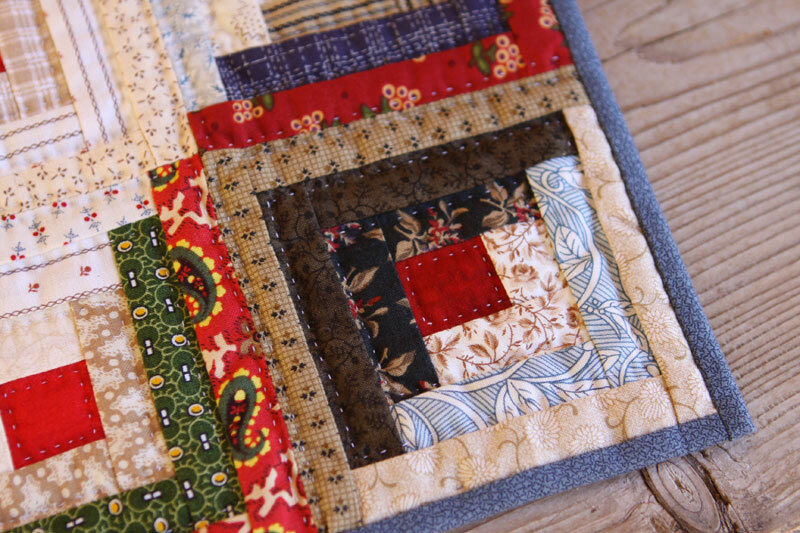 Love the hand quilting you did on this treasure! So beautiful! Love your little log cabin and such tiny stitches. 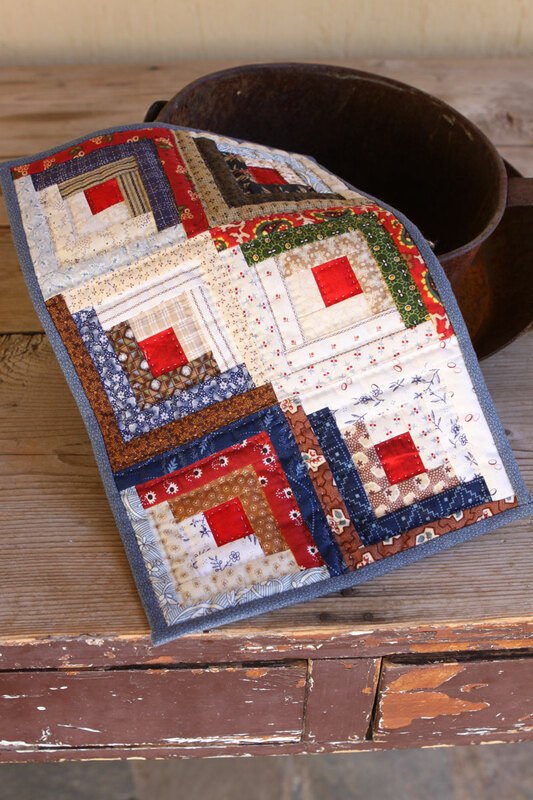 What a pretty little log cabin quilt. I love the colors. 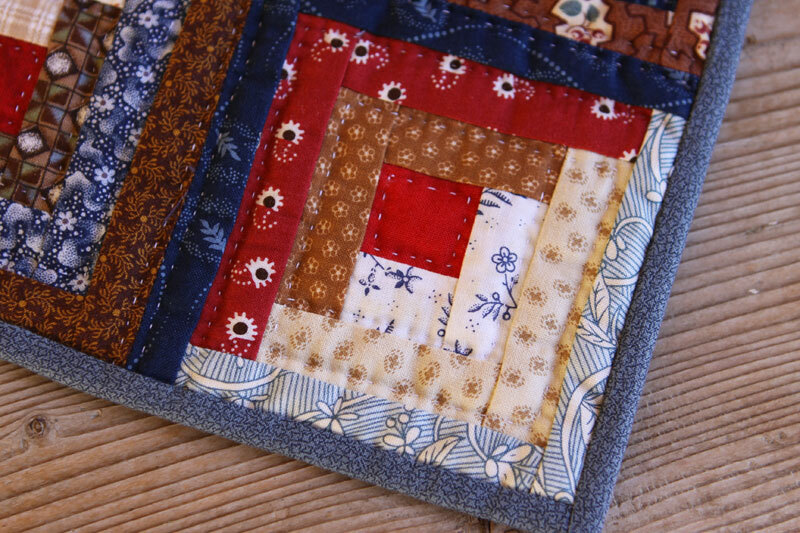 This little quilt is so pretty...thanks for sharing it with us.